Awesome low-tech fun – the essence of camp. Some of our activities (swim time & horseback rides) are pre-scheduled to ensure that everyone gets a chance to enjoy them. On the first night of a full-week session, campers and leaders discuss and choose the rest of their adventures for the week. We offer a progression of activities based on the age group, program focus, and skill level of our campers. There are new challenges and experiences for the youngest of campers all the way to more adventurous older youth. 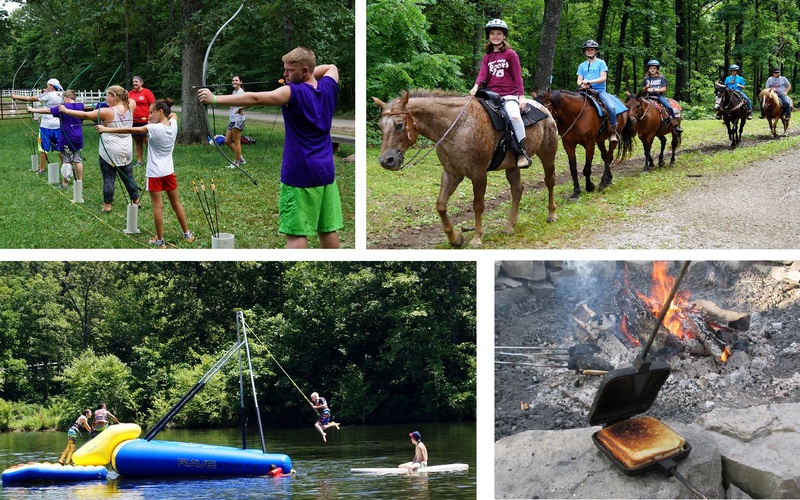 Check out some of our favorite camp activities below. Bible Learning And Spirit Time is a daily hour of chaplain-led songs, crafts, games and reflections relating to the daily theme and Bible verse. Many of the best conversations at camp happen as we wind down at the end of the day. Whether sitting around a small campfire with our family group or a single candle in the cabin, Candle Time is a moment for intentional and thoughtful reflection about the day and discussions about faith and life. Hot dogs, foil stews, pie iron pizzas, s’mores – sound delicious? Cookouts are an integral part of our group-building focus, especially for our older campers. Outlanders have the option to cook out twice! Get ready to get wet! Whether campers want to learn about stream ecology and erosion or just splash around, the creek is a great place to cool off. Jump into the pit for this more humane version of dodgeball. Skill and luck play equal parts in this fast-paced game that anyone can win. Large and small groups play a variety of fun and engaging games. These activities focus on active participation as opposed to winning and losing. Elbow Tag, Scream & Run, Ninja, Everybody’s It and Captain Midnight are only a few of our favorites. No doubt about it, our horses are the most popular kids in camp, and all campers have the option to ride. Campers receive instruction in basic barn etiquette and how to safely lead, mount, ride and dismount a horse. Our riding instruction is based on safety and recreation. It is not intended as instruction for horse shows or competitions. Campers attending week-long sessions have the option of riding twice during their stay; part-week campers have the option of riding once (weather permitting*). The first ride includes time in the arena to get comfortable with the horses and practice basic skills. A short trail ride may also be included. The second ride is usually a longer trail ride. Campers attending our Horse Camps spend significantly more time with the horses. *For the safety of our campers and horses, rides are cancelled whenever there are heavy rains, storms, lightning or if the heat index reaches one hundred degrees. We do our best to reschedule any rides that are cancelled. Learn more about our equestrian program and horses here. Whether on a dedicated nature hike or just walking to breakfast, DuBois Center is a great place to explore creation – deer, owls and beautiful native wildflowers are common sights! Habitat, Bat & Moth and Hug-a-Tree are favorite games that help campers explore the natural world. Once the sun goes down and the lights go out, the world looks a lot different! Learning how our senses adapt to the darkness is just part of the adventure. It could be an evening of active games, or just quiet time soaking in the light of a starry night. A mash-up between four square and volleyball that is played with a nine-square grid overhead – luck rules, and anyone can win! Swim! Splash! Float! Play! Campers have the chance to hit the beach daily. The sand is perfect for sandcastle building contests or a game of beach volleyball! Our waterfront, supervised by certified lifeguards during each activity, is split into shallow and deep ends to accommodate different skill levels. A series of engaging challenges that stress teamwork over individual achievement. Campers begin to recognize that when they think before acting, they can accomplish more together as a group. It’s simple cooperative games for younger campers, and more challenging initiatives for older campers. Balancing on wires, swinging through the air, climbing and crawling – all with the integral support of cabinmates. Groups build on the cooperative skills developed during Team Building and take on greater challenges. A trained leader facilitates effective communication and teaches advanced techniques which enable groups to safely support one another on our low-ropes teams course. WALK ON WATER… or at least the water mat. Our water mat is a camp favorite! Campers jump, play and dance across our floating mat – some of the most fun you’ll see on water! PFDs are required, so all campers are able to participate, regardless of swimming ability.